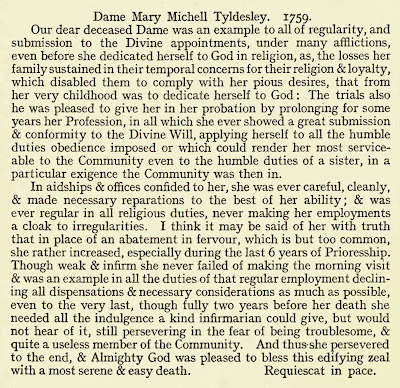 Dame Mary Michell Tyldesley. 1759. Our dear deceased Dame was an example to all of regularity, and submission to the Divine appointments, under many afflictions, even before she dedicated herself to God in religion, as, the losses her family sustained in their temporal concerns for their religion & loyalty, which disabled them to comply with her pious desires, that from her very childhood was to dedicate herself to God : The trials also he was pleased to give her in her probation by prolonging for some years her Profession, in all which she ever showed a great submission & conformity to the Divine Will, applying herself to all the humble duties obedience imposed or which could render her most service able to the Community even to the humble duties of a sister, in a particular exigence the Community was then in. In aidships & offices confided to her, she was ever careful, cleanly, & made necessary reparations to the best of her ability ; & was ever regular in all religious duties, never making her employments a cloak to irregularities. I think it may be said of her with truth that in place of an abatement in fervour, which is but too common, she rather increased, especially during the last 6 years of Prioresship.Though weak & infirm she never failed of making the morning visit & was an example in all the duties of that regular employment declining all dispensations & necessary considerations as much as possible, even to the very last, though fully two years before her death she needed all the indulgence a kind infirmarian could give, but would not hear of it, still persevering in the fear of being troublesome, & quite a useless member of the Community. And thus she persevered to the end, & Almighty God was pleased to bless this edifying zeal with a most serene & easy death. Requiescat in pace.